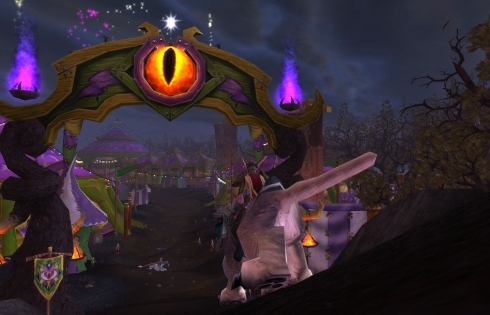 The Darkmoon Faire is now welcoming visitors to Darkmoon Island for fun and mayhem. While still under the management of Silas Darkmoon, the Faire is no longer the washed out carnival of the past. It has been radically revamped – including a lead in quest, teleport to the staging post, a whole new area, more games, mounts, companion pets, achievements, quests & dailies. During the weeklong celebration of the Faire at the start of each month, Darkmoon Faire Mystic Mages in the factional capitals offer the lead-in quest (The Darkmoon Faire). They will also – for a small fee – teleport you to the staging area of the Faire in Goldshire, Elywyn Forest (Alliance) or near the base of Thunderbuff, Mulgore (Horde). A portal at the staging area transports you the Darkmoon Faire Isle shrouded in mist and mystery somewhere in the Great Sea. On arrival, take the path (marked by arrow) down through the dark woods (watched by the flashing eyes in the bushes reminiscent of Duskwood), until you come to the carnival area. Like Shattrath, Dalaran and the Argent Tournament, the path through the woods and Faire are Sanctuary areas with fighting between factions forbidden. This, however, is not true of other parts of the Island. At the south end of the carnival area on the Boardwalk are two portals back to Alliance and Horde staging areas. The Faire now offers new attractions, monthly quests, dailies, achievements, reputation and vendors of rare and mysterious objects. Moreover, the Tauren Chieftains currently play at the Faire regularly. The Exposition, South, West and East Pavilions are still under construction – no doubt new experiences and rewards await us once they are completed. From their different booths or carts, Darkmoon vendors offer (in exchange for Darkmoon Faire Prize Tickets though sometimes for gold) diverse wares such as special food, drink, epic and heirloom gear, Darkmoon game tokens, balloons, novelty items, speciality fireworks, companion pets and mounts (including a Dancing Bear). The Darkmoon tickets (placed in your currency page) are earned by doing the monthly quests or the dailies and replace the now old tattered and useless tickets earned before 2012. The games and attractions have been expanded from the old faire and have a midway or sideshow alley feel about them. Each of the games requires a Game Token. They can be purchased in a pouch (5 tokens) or sack (20 tokens) from Zina Sharpworth at the north entrance of the Faire grounds, Sazz Coincatcher next to the Shooting Gallery or Trixi Sharpworth closer to the Boardwalk in the south. Dismount (if mounted) and speak to the appropriate vendor when ready to play. A special tool bar will appear for one minute. Additional tokens will give additional minutes of play. Each game is associated with a daily which awards a prize ticket and reputation (see below). Cannon Launch yourself from the 5000 Blastenheimer Ultra Cannon operated by Maxima Blastenheimer. Once launched you can float with your wings, or shed the wings to land on or near one of the targets in the sea. Landing nearby gets you 1 point, within the ring gives you 3 points and a bulls eye gets 5 points. You can speak to Fozlebub, who is fishing on the shore, to port you back to the canon for a small fee. Whack-a-Gnoll While Sayge doesn’t really approve, this is a fun filled game in which the aim is to whack gnolls. Speak to Mola to play the game. Three types of gnolls pop out of the barrels – aim to hit the regular (give 1 point), Hogger (give 3 points) and avoid the babies which will stun if you hit them. After one minute players are stunned and transported out of the ring. Ring Toss – the aim of this game is to toss rings on to a pole on the back of a slow moving turtle. Make sure you are standing close to the counter and then place the targeting circle on the turtle and click. This is by far the easiest game and should only need one game token to complete the corresponding daily. Shooting Gallery – shoot targets at Rinling’s booth. Make sure you are standing against the counter (not on it or back from it) and shoot at the target with the green arrow over it. Hitting the target within a second of the arrow appearing awards quick shot. Fortune Teller- the Gnoll Sayge will give you an hour buff (e.g. Damage, Intelligence, Armor) once you have answered a series of questions. He will also supply written fortune cookie style sayings on request. Zoo & Petting Zoo – a large display of exotic animals plus a small area where you can ride a Darkmoon pony (for I Was Promised a Pony achievement) or ram. Darkmoon Deathmatch – Korgal Crushskull places a chest full of goodies at the centre of the fighting pit to be claimed by the quick, the strong and the brave every 3 hours from midnight. Winning the bout awards a trinket and Darkmoon Duelist achievement. The Tauren Chieftains – the Chieftains are currently playing hourly on the stage at the south end of the Carnival. If you haven’t experienced this show, it’s well worth experiencing the show. There a couple of general quests (available from level 5). The Darkmoon Faire – Lead in quest obtained from Darkmoon Faire Mystic Mages in the factional cities – often near either auction houses (eg Ironforge, Stormwind City) or the gryphon or windrider handlers (eg Orgrimmar, Darnasuss & in a way at Thunderbluff,). On handing the free voucher to Gelvas Grimgate, he will give you Darkmoon Adventure Journal & 5 prize tickets. Test Your Strength – the Strong woman Kerri wants you to collect 250 grisly trophies to show you strength. These drop from creatures that award honour or experience as long as you have the Adventure Guide. Awards 10 Prize Tokens. Fun for the Little Ones – Collect 15 fossil fragments from Archaeology for Professor Thaddeus Paleo to bury in the sandpit for the children. Handing in the quest gives +5 in Archaeology skill, a Game Token, 3 Prize Tokens and Darkmoon Faire Rep. The fossil fragments will be used up. Spoiling for the Salty Sea Dogs - Stamp Thunderhorn asks you to catch 5 Herring in the ocean around Darkmoon Island. Awards +5 fishing skill, 1 game token, 3 prize tokens, experience and reputation. Putting the Crunch in the Frog – Stamp Thunderhorn asks you to flour and cook 5 plump frogs, using the cauldron at the back of his stall. You will need simple flour from a trade goods vendor (for Alliance – Tharynn Bouden stands near the staging area at Goldshire). Awards +5 cooking skill, 1 game token, 3 prize tokens, experience and reputation. Putting the Carnies Back Together Again – Heal 4 injured Carnies with the bandages supplied by Chronos. Awards 5 points in First Aid, 1 game token, 3 prize tokens, experience and reputation. Tan My Hide – Scrap 4 skins staked out around the carnival Grounds. Awards +5 Skinning Skill, 1 game token, 4 prize tokens, experience and reputation. Rearm, Reuse, Recycle – Ringling asks you to collect 6 Tonk metal scraps around the Faire grounds. Awards +5 Mining Skill, 1 game token, 4 prize tokens, experience and reputation. Eyes on the Prize – Ringling (at the Shooter’s Gallery) asks you to use the Darkmoon construction kit and some common vendor items (shiny baubles available from the Fishing Vendor in a booth on the Board Walk, blue dye, coarse thread) to construct 5 Darkmoon Prizes. Awards +5 Leatherworking Skill, 1 game token, 4 prize tokens, experience and reputation. There are also specific quests for inscription, blacksmithing, enchanting and tailoring. Dailies require a specified number of points or hits within the different games of the Faire. The scores can be accumulated over a number of game sessions (not just within the minute). It’s Hammer Time (Whack-a-Gnoll) requires 30 points; Tonk Commander requires hitting 30 targets, He Shoots , He scores! (Shooting Gallery) requires 25 of hits, Target: Turtle! requires landing 3 rings while A Human Cannonball needs 5 points (a bulls eye or some combination of points). Each daily rewards one Darkmoon Prize Ticket. There are a range of new achievements (look under World Events: Darkmoon Faire) from the dead easy (e.g. Come One! Come All! – attend a Darkmoon Faire), to the relatively easy (e.g. Step Right Up – play all 5 of the Faire games or Faire Favours – complete at least 6 profession-based DM Monthly quests) to the more difficult (Darkmoon Duelist – win the Darkmoon Deathmatch and receive the pit fighter trinket)! At this stage at least, there is no meta-achievement or title for completing a number of these achievements. Monthly quests and dailies all award Darkmoon Faire reputation. Darkmoon Cards can still be collected and can be handed in to Professor Thaddeus Paleo in exchange for a trinket and reputation with the Faire. All in all, the Darkmoon Faire now offers many more incentives to visit. Now visitors will surely include – not only those who wish to build Darkmoon Rep for the Insane in the Membrane Achievement or to hand in the Darkmoon cards for quickly surpassed Trinket– but anyone who would like to level their professions, get some cool new companion pets or mounts, or some classic armor to use as a model on which to transmogrify their current set or just for a change of scenery or some pvp fun in the pit. Do I detect just a hint of intrigue here? What deals have been made and with whom? Sometimes, a path that seems enticing and innocuous can lead one into darkness, distress, danger and despair. What harm can seeking one’s future fortune do? Caveat emptor Let the buyer beware!